As the Western Hockey League jumps into its first full weekend of 2018, the trade deadline is less than a week away. The Jan. 10 deadline looks like it could be an interesting one as there are several contending teams that could use upgrades to their roster. Will we see any blockbuster trades? The WHL typically doesn’t see huge names moved, like you might see in the OHL or the QMJHL, but the potential is there this year. Which teams help themselves? Which teams might sell? Whether they are buyers, or sellers, below is a list of the most interesting teams to keep an eye on over the next few days. This season has not gone as the Pats had hoped. Strapped with the honor, and pressure, of hosting the Memorial Cup this May, Regina has been inconsistent this year. They sit in fourth place in the Eastern Division and hold the first wild card slot in the conference. Not the resume of a typical Memorial Cup team. They made a move earlier in the season to pick up Cale Fleury from the Kootenay Ice but it hasn’t solved all their issues. Sitting on a four-game win streak, the Pats will be players this week and up to the deadline. Will they add more scoring? Will they add a goaltender? They have allowed more goals than they have scored this year, which is remarkable considering the offensive power we saw from Regina last season. 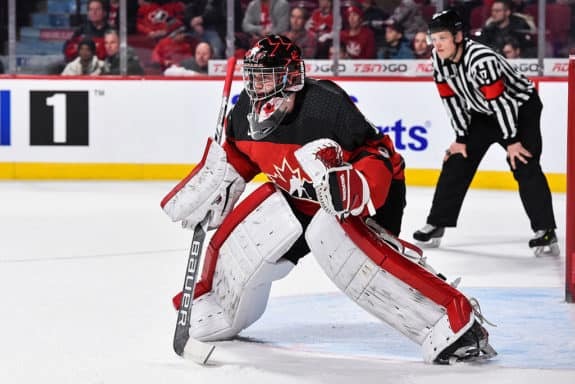 Sam Steel will return to the fold as the World Junior Championships wrap up but he could use some help and the team probably needs to shore up the back end. It’s a tall order for head coach and general manager John Paddock. Does he sell the future for a shot at the Memorial Cup? Things looked bleak to start the year for the Blazers and while they’ve been playing better, they currently are five points out of the Western Conference playoff race. This is a club that might find itself in the seller category. Kamloops has put in a bid to host the 2020 Memorial Cup and selling assets to help build a competitive team by then is a possibility. The Blazers have some attractive assets to offer. Garret Pilon, a 19-year-old Washington Capitals prospect, is off to a career-best start with 17 goals and 42 points through 38 games. 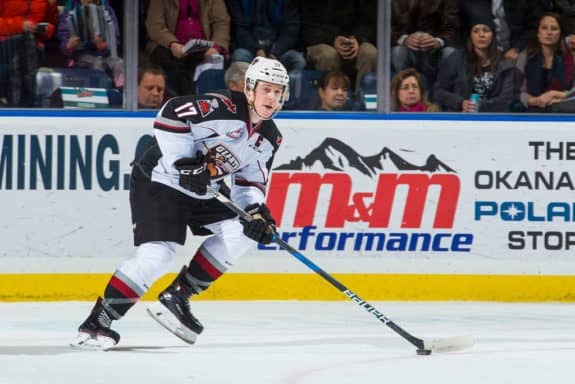 Dallas Stars prospect, defenseman Ondrej Vala, can add offense to anyone’s back end and with the lack of high-end goalies in the WHL, Las Vegas prospect Dylan Ferguson could be attractive. It’s safe to say that the Blazers are getting calls about their assets. Will they move some for future rewards? Goalie Carter Hart has carried the Silvertips to a surprising spot on top of the U.S. Division. The Everett start has also turned the Silvertips from perceived sellers to a buyer at the deadline. They have allowed the fewest goals in the league but despite a recent scoring surge are averaging 3.28 goals-per-game. The only Western Conference teams with a lower average are Kamloops and Prince George, two teams out of a playoff spot. The Silvertips could use help on their top six in order to find more consistent scoring and could also look to add a puck-moving blueliner to help churn the offense. The question is, does general manager Garry Davidson have the assets to outbid other contenders? The Hitmen already made one significant trade back in November but hold perhaps the biggest trade chip. Defenseman Jake Bean, a Carolina Hurricanes prospect, has been away with Team Canada at the World Junior Championships but he could be in play this week. The Hitmen will have several suitors for Bean and if they play their cards right, could end up getting quite a haul for him. Several contending teams, like Everett, Portland, Tri-City, and Regina could use a player like Bean. Let the bidding start. The two preseason U.S. Division favorites should be buyers this week. Portland limped its way through a brutal December where they won only three games. Despite the slump, the Winterhawks are only a point out of first place, with games in hand. They’ll welcome the return of Kieffer Bellows, Henri Jokiharu and Joachim Blichfeld from the World Juniors but could still use some secondary scoring and potentially another defenseman. The Americans were in a good spot a couple of weeks ago. Only four points back of Everett but with several games in hand. The injury bug has struck them hard, however, as it was announced last week that Detroit Red Wing first round pick, Michael Rasmussen will miss 4-8 weeks with an injured hand. How does this change general manager Bob Torry’s trade deadline plans? These are two teams that have tradeable assets that have the league’s fan message board heroes salivating. Those fans will be disappointed, as both teams will likely not be selling. The Blades hold the Eastern Conference’s last playoff spot and after a long drought, making the playoffs is the goal here. Because of that, Cameron Hebig and Libor Hajek should be staying put. Vancouver is in the same situation. After missing the playoffs last year, they won’t want to make it two years in a row especially, when you consider this is their second season in a new arena, the Langley Events Centre. 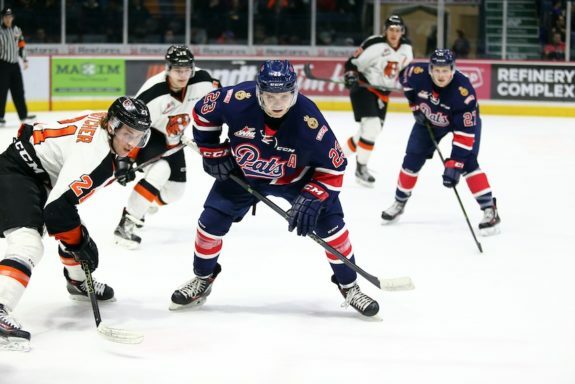 Despite Ty Ronning and the resurgent Tyler Benson being in their last year of junior, the Giants are holding on to them. Vancouver has had a decent year overtaking Victoria for second place in the B.C. Division and therefore they might look to add.